The three owners of Three Penny Taproom seem to be making a habit of claiming empty storefronts and turning them into eateries. First, in 2009, came the original pub on Montpelier’s Main Street; a year later, the trio opened the Mad Taco in Waitsfield with Joey Nagy, followed in 2011 by another Mad Taco in Montpelier. Yet, even as they expanded into new spaces, they were chafing against the snug confines of Three Penny itself, where chef Matthew Bilodeau turned out a modest menu with just a Crock-Pot, a panini press and other assorted equipment. After a quick but intense renovation, the crew opened the restaurant’s doors in early July, revealing a modern-rustic décor: a necklace of tall wooden benches around the room; a cool, green hue on the walls; and a long, communal elm table in the middle. 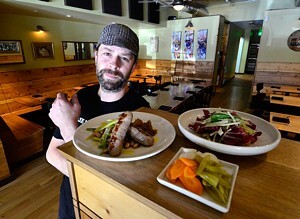 The new menu has a spare, gastropub ethos, too, with items such as housemade sausages, clam fritters and a chicken pasty. And, for the first time, Three Penny has a burger. Bilodeau became known as a master of that pub staple when he worked down the street at the Black Door Bar & Bistro, but it was impossible to prepare and serve when Three Penny was limited to a tiny back-room food station. A stormy Monday night seemed like the ideal time to avoid the crowds and check out Three Penny’s new fare. But, despite the rain, the bar was lively, and the wait for a table was a half hour. Since the pub doubles as a waiting room, we ordered beers (a Stillwater Cellar Door saison for me) and loitered near the front window until our table was ready. The wooden floors and benches lend an Alpine-lodge kind of warmth, but the hard surfaces also amplify conversation and clinking plates. Rather than shouting over the din, my companion and I lost ourselves in the menu, ordering pickles ($4) and bread with farmer cheese ($4) while we agonized over the other options. The dishes are arranged by size, from “first bites” (such as the pickles) to large plates. Most of them sounded intensely compelling; skimming the menu was akin to browsing British television, where there are only four channels but you want to watch every one on each. Around us, it looked like industry night: Chef/owner Eric Warnstedt of Waterbury’s Hen of the Wood sat at one table; Williston-based cookbook author Molly Stevens at another. Soon a hefty tower of crusty, char-grilled Red Hen bread arrived; it served as a garlicky canvas for the mild farmers cheese we spread on top, and tasted better still smeared with tangy cultured butter. Along with the tiny plate of piquant pickles and pickled radishes, this snack nearly filled us up — especially because we devoured it while waiting through languid service for our entrées. We should have saved more room, because what came next was an almost medieval spread: a burger, cucumber-and-goat-milk gazpacho, summer sausages with a three-bean salad, and a chicken pasty. When the diners beside us raved about the clam fritters, we ordered some of those, too. The dishes were served at an erratic pace, with some larger plates appearing before the smaller ones. For instance, we were given a bowl of mussels ($12) long before the gazpacho ($3). Because we didn’t actually order the mussels, the waiter offered to let us keep them for free. So we tucked in. Each one we pulled from its steamy, ale-mustard bath was plump and fresh, but slightly smothered by what we thought might be a touch of anisette or pastis in the broth. The trio of clam fritters ($9), which comes with an excellent homemade rémoulade sauce, was delectably golden brown but bready. The missteps ended there. We were entranced with our chicken pasty ($8); when we pierced its buttery pastry, pieces of succulent, braised meat spilled out, slightly sweetened by wilted herbs. My friend didn’t care for the leaves of radicchio on which the pasty was served, but I loved the jangling contrast between its sweet dressing and the bitter leaves. And the gazpacho — delivered in a shot glass, sans spoon — was viscous, minty and fresh, like a wet, grassy field decanted into a glass. The wine list at Three Penny is as well curated as the craft-beer selection; I didn’t expect to see as many bottles of wine on nearby tables as I did, especially with Three Penny’s off-the-hook tap list on a chalkboard above the front door. There was barely room on ours to fit the glass of Tegernseerhof Zweigelt Rosé I ordered, but we managed. Passersby raised their eyebrows at the sheer volume of food before us. Next to us, three friends all ordered the same dish: burgers topped with cheese and bacon. After taking a bite, one leaned back in his seat with a deep sigh. “Good?” I asked, unsure if he was disgusted or enraptured. After a pause, that friend reverently recalled Bilodeau’s burgers at the Black Door, and said he rejoiced at their reappearance. Bilodeau is the only chef who would deliver a burger this rare, he declared, and it was very, very good. 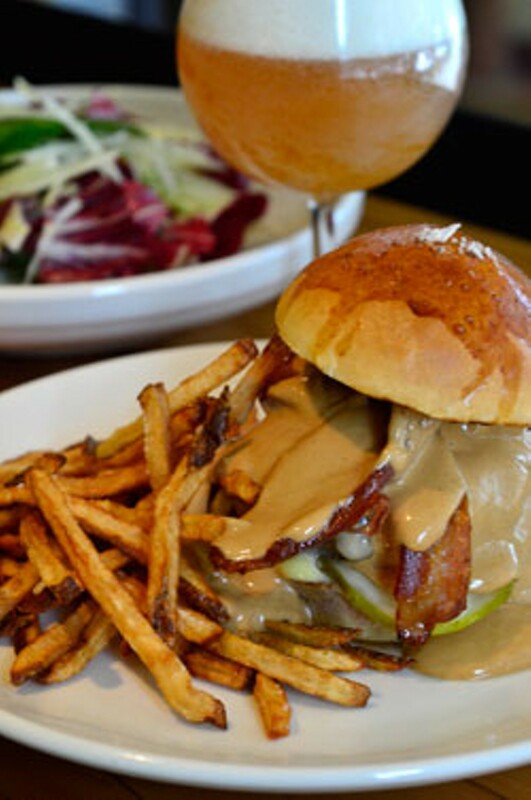 So was ours — an oozing, melty, delicate, sublime burger, topped with aioli that spilled over the sides of a crusty house-made bun. It was the star of the table. By the time we moved on to the summer sausages ($10), we were about to explode. But each bite of the glistening, tender pork sausages led easily to another, and though I was sure they’d been washed with some kind of ale, our waiter shook his head. The three-bean salad was a riot of color and fatty and tangy flavors. We braced ourselves for the bill, then almost gasped at the relatively modest price of this gluttonous feast: $69. That left extra change for dessert, we reasoned. But it meant another hard choice: elderflower panna cotta or ricotta doughnuts? A few minutes later, we tucked into misshapen balls of fried dough topped with shaved dark chocolate. They could have been crispier and sweeter, but we admired the dessert’s chutzpah. By the time we stumbled out into the humid night, we had been at our table for two hours and eaten enough food for four people. It would be easy to order half as much and still leave Three Penny sated. And we will: After our meal, we learned that Three Penny’s menu will shift every few weeks to keep pace with seasonal ingredients, and we’d unwittingly visited the week before a transition, as well as a night when Bilodeau was away. We hope the fare stays as hearty.